Effortlessly sophisticated, these 9ct gold hoop earrings feature shimmering cultured freshwater pearls hanging delicately beneath. Designed to see you from daytime to evening in versatile style. 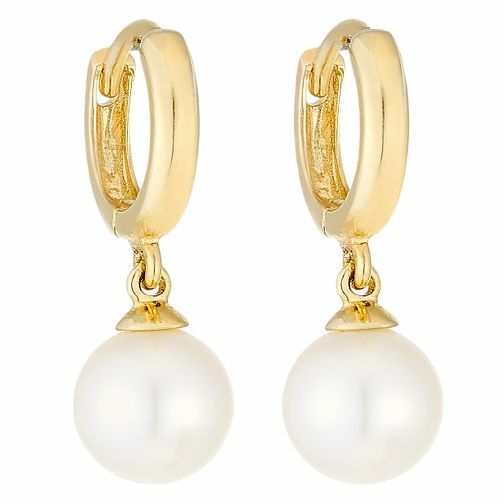 9ct Gold Cultured Freshwater Pearl Hoop Earrings is rated 4.0 out of 5 by 2. Rated 3 out of 5 by Anonymous from Attractive pearl, very elegant style, but a little delicate! Purchased as a gift for my wife, when a pearl was specifically appropriate. The shape and size of the pearl, together with the subtle length of the ‘drop’, was appealing to my wife and these earrings seemed perfect. They did look very attractive when fitted and my wife was delighted. Regrettably, the ‘hoop’ which needs to be threaded into the ear piercing is a little too delicate. It easily becomes distorted which results in additional difficulty in installing but, of more concern, the resultant distortion tends to make the clasp liable to become less effective and frequently to come undone. With careful readjustment by hand (very careful and controlled force is necessary) it was possible to bend the hoop and clasp back to a form resembling its original shape. This was fiddly, but worthwhile as it lowers the risk of the earring becoming unattached and possibly falling out. We chose to persist with the subtle adjustment of the hoop and clasp as my wife really likes the earrings.